So I headed off into the wilderness of the Internet to see what creative uses for Nutella I could find. I had no idea baking with Nutella was such a popular (and slightly scary) thing. There are veritable lists upon lists of things one can do with Nutella. Outside of the regular ideas of using it in cheesecakes, cookies and brownies, I also found out you can make it into drinks, turn it into fudge, and my personal favourite oddity: Nutella covered bacon ! I’m not going to lie – I got a little scared. 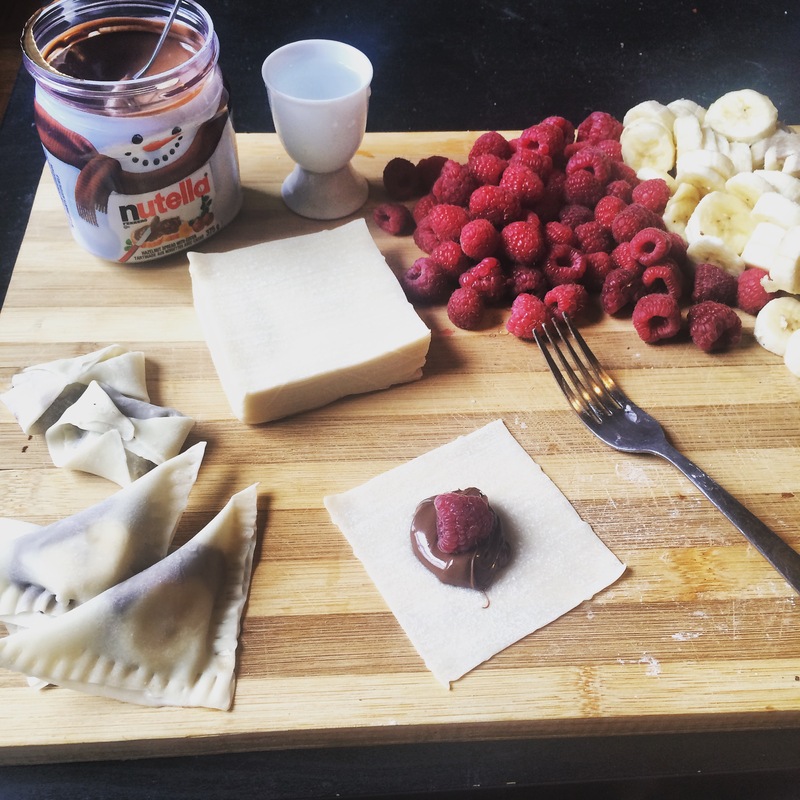 So for tonight, I’m going to keep it simple: I’m taking advantage of the ease of using store bought ingredients to make these quick baked Nutella Bites with Bananas and Raspberries. Because really, what is better than sweet chocolaty dumplings? Recipe Note: This recipe is so adaptable. Use strawberries instead of raspberries, don’t add fruit at all, use whatever Nutella type spread you have kicking about. Let your imagination and sweet tooth guide you. If using fruit, slice bananas into medium rounds. If using strawberries, dice into bite-sized pieces. Brush water on the edge of the skin and fold in half, pressing it hard to make the two sides stick well. You can use a fork to press down on the edges to make sure they stick, and to create a lovely pattern. Arrange the prepared raviolis on a nonstick baking tray, or spray a baking pan with cooking spray before placing them on the pan. You can also either brush the ravioli with olive oil or Brush them with oil, or if you’re felling fancy use an egg wash.
Bake for 8-10 minutes, or until the skins are crispy or golden brown. Sprinkle with powdered sugar and serve with ice cream if desired.